We are located 2 miles from the West entrance of Bennett Spring State Park on Highway 64, just 15 minutes from Lebanon Missouri in the heart of the Niangua River Valley. The Niangua River and Bennet Spring is considered by many as a trout fishing and paddling paradise. 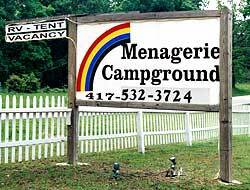 Menagerie Campground rests in a quiet location with lots of trees and always a breeze during the summer months. The grounds are covered with trees, wild flowers, hummingbirds and golden finch and it is not uncommon to see whitetail deer and wild turkey roaming among the timber. 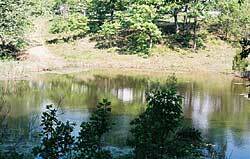 Just below the campground there is a large pond to practice with your fly rod or just sit and watch the wildlife. We offer 47 full service RV sites, private ADA shower/restrooms, laundry room, horseshoe pits and a large shelter for cookout gatherings. Scheduled BBQ cookouts, Bingo night and Annual Garage Sale events are always ongoing in which all campers are welcome. Many of the residents of Menagerie are long time RV campers that have selected us as their "home away from home" because it is quiet, peaceful and secure and we are always nearby if they need assistance. We hope that when you feel the need for a new experience, you'll consider Menagerie as your "get away."